How To Identify Phlogopite Powder? As a Phlogopite Mica Manufacturer, let's talk about how to identify phlogopite powder. Phlogopite Mica features complete cleavage with mica, yellow-brown color and gold-like reflections. The difference between phlogopite and muscovite is that it can be decomposed in boiling sulfuric acid and simultaneously produces a milky solution, while muscovite does not. The general characteristics of phlogopite are the same as that of muscovite. The phlogopite powder is mainly distinguished from other mica by brownish or pale gold. The identification method of black mica similar to color is that its color is lighter than that of biotite. The two were torn into thin sheets and placed on a white paper. The phlogopite was pale yellowish brown, while the biotite was grayish green or smoked. The exact identification of the colorless or other color Phlogopite Mica requires the aid of a microscope. The phlogopite powder is widely used in the chemical industry such as building materials industry, fire protection industry, fire extinguishing agent, welding electrode, plastic, electrical insulation, paper making, asphalt paper, rubber, pearlescent pigment and so on. Ultrafine phlogopite powder is used as a functional filler for plastics, paints, paints, rubber, etc., which can improve its mechanical strength, enhance toughness, adhesion, anti-aging and corrosion resistance. The industry mainly uses its insulation and heat resistance, as well as acid resistance, alkali resistance, pressure resistance and stripping. The phlogopite powder made from Phlogopite Mica is used as an insulating material for electrical equipment and electrical equipment. Next: Wish My Friends A Happy Songkran Festival! 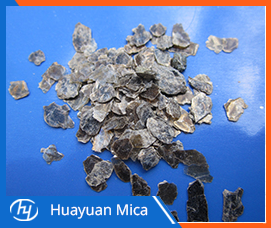 Contact us Lingshou County Huayuan Mica Co., Ltd.